Issued from 1862 until 1927 and are known as “marenghi” with the Savoia coat of arms on the reverse and King Vittorio Emanuele II on the obverse. The 20 Lire coin dates back to the start of the 19th century, when the currency was introduced to by the Napoleonic Empire. It was short lived, but made a return, in a different form, come the middle of the century, when reforms led to the Lira becoming the national currency of Italy. Lira, a Latin term, can be translated as Pound in English, and is where the British currency gets its name. This can be seen in the Pound sign, which is essentially an “L” with a line, sometimes two, through it. The Lira often used the same symbol to denote the Lira. The Lira was eventually discontinued by the introduction of the Euro in 2002, but gold and historic coins still remain highly popular with collectors. The 20 Lire coin, from 1861 until 1927, was known as the Marenghi (Marengo in the singular) and had several designs during this 66-year period. 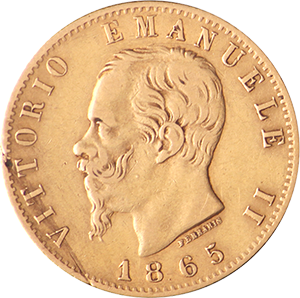 Between the years 1861 and 1878 the coin’s obverse depicted King Vittorio Emanuele II, from 1878 until 1900 it had the figurehead of Umberto I and, in its last years up until 1927, King Vittorio Emanuele I. 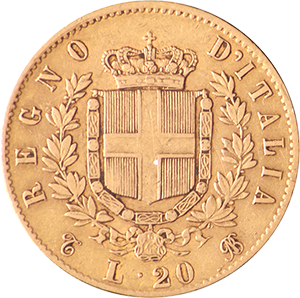 On the coin’s reverse is the Savoia coat of arms. The coin measures 21.2m in diameter and has combined weight of 6.4516g. Its purity is up there with the most valuable widely circulated coins of its era, 21.6 carats, which amounts to 5.8g of fine gold. While the gold content alone gives the coin some worth, it is combined with its historic aspects that the true value for collectors becomes apparent. The coin’s design is highly intricate for such a widespread currency of its era, with particular attention to detail paid to the various figurehead’s hair. For this reason, the Marengo is considered one of the most aesthetically appealing of coins for its era.